A pedestrian crossover is a type of crossing where drivers must come to a full stop to allow pedestrians to cross roads safely. 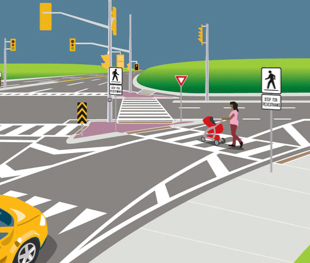 Pedestrian crossovers are located on streets between intersections, at roundabouts, or at right-hand turn lanes with specific signs and pavement markings. 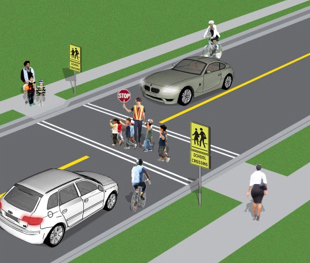 Crossovers are different from crosswalks, which are usually located at an intersection with stop signs or traffic signals. 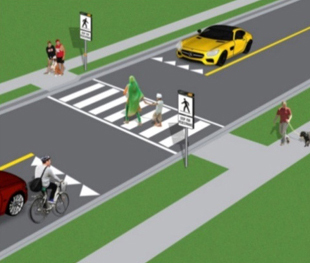 Ontario's 2016 pedestrian crossover law states that drivers must come to a full stop to allow pedestrians to cross the road safely. If you don't stop completely for pedestrians at a crossover, you can be issued four demerit points and fined up to $1000. "I cross at the corner"
"I never run across the street through traffic to catch a bus"
"I push the pedestrian signal button so I have enough time to cross the street"
"I wait until it is safe to cross where there are no signs or signals"
"I wear light-coloured clothes at night"
"We don't jaywalk through traffic"
"We don't play chicken with cars"